A while back, I decided a good way to get involved in my neighborhood and community was to volunteer at my polling place (Hoyt School) during elections. I did some digging and could find no information on how you do this in Madison, so I eventually e-mailed my Alderperson. She immediately put me in touch with the proper deputy city clerk who handles poll workers, or “Election Officials,” as they’re known. The Deputy Clerk notified me of a training session in January, which I attended along with about 200 other people. One of the other volunteers said the last time she’d come to the training, there were 30 people there. I asked at the training session how and when I’d find out if I’m scheduled to work or not. The city officials there said they’d start with the regulars on their list for each polling place and if they needed more, they’d start calling us new volunteers. (Actually, I learned that Election Officials aren’t volunteers. They are paid $9.00/hour for their time.) Weeks went by and I didn’t hear from the Deputy Clerk so I assumed they had fully staffed my polling place. I have to admit I was disappointed, because I was looking forward to helping out. This Tuesday morning, primary day, Laura asked me one more time, “Did you ever hear from the city about working at Hoyt School?” I hadn’t. Oh well, they must not need my help. Then back to Hoyt School at noon. I’m sworn in, using this verbose oath that the Chairman says got a lot longer after the 2000 Florida debacle. Since I’m the only new person, I get to do everything in order to learn. I sort and log in absentee ballots. I log in registered voters and hand out ballot slips. I write the ward numbers (70… 70… 70… 70… 70… 71… 71… 71… 71…) on pads of voter slips. And worst of all, I get to register new voters. I am a complete curiosity at Hoyt School because I am 25-35 years younger than any other Election Official. (Except for my alderperson, who was the only other non-grey head there.) Both the other Election Officials and the voters want to know what my story is and why I’m there. They seem surprised that anyone under 60 cares. This makes me sad. Voter traffic is steady all afternoon. It’s mostly full-time parents and old people during the day, and then things pick up as working folks come out after quitting time. I’m pretty sure I was “set up” to be at the voter registration table for the after-work rush, but hey, what’s wrong with a little hazing of the new guy huh? I’m registering people with alderperson, and in between customers she’s telling me all the behind-the-scenes scuttlebutt on the neighborhood, such as the UW is selling Hilldale Mall (our neighborhood shopping center) and the whole block it’s on to a group of Chicago developers for $80-odd million. We can expect big changes there and elsewhere along University Avenue. About 2pm there’s a water leak in one of the locker rooms at Hoyt School and they have to shut the water off. We have no bathrooms or drinking water until they get it fixed about 5:30. Good thing I brought my own water. But do I really want to drink any? Cuz then I might have to…. About 6pm things go bananas. The registration tables are out in the school hallway and the entire hallway is clogged with people. Most of the registrations were students with address changes. The rest were new residents from out-of-state or out-of-town. We register about 100 people to vote between 6:00 and 6:45. This is a miracle, because the voter registration forms are, well, government forms and they’re cumbersome and confusing. We also have to figure out, based on the person’s street address, whether they’re in Ward 70 or Ward 71, because this polling place straddles two wards. So we have to look up everyone’s address on this confusing sheet of paper, face south, make them sign another piece of paper, wiggle the big toe on our right foot, give them a voting slip, sing “On Wisconsin,” and finally send them on their way to get a ballot. During this peak time, we are registering a new voter on average about every 27 seconds. Any way, we somehow keep things moving and the people just keep coming. Finally it’s 8pm and the polls close. The people are still coming right up until 8:00. The Chairman goes to the front door to make the public pronouncement that the polls are closed and comes back smiling. He says his announcement was met with a loud “Sh*t!” from the darkness of the parking lot. People still come after 8:00 and we have to turn them away. One woman has brought her young son and we let her in and she shows him how everything works. We give her a sample ballot so she can show her son how everything gets marked. Madison uses optical voting machines. We have to run the tallies from the machine. We have to pull out all the ballots that registered write-in votes and tally them. We have to pull out all the other ballots and bag them up and seal the bags. We have to bag up the spoiled ballots and seal them. Everything gets signed by a bunch of people. Two people from county commissioner campaigns actually sit out in the hall and wait for the tallies. We forget about them until finally one walks in and asks for the numbers. Whoops. Sorry you missed a half-hour of the election-night party, dude. We have to knock down and fold up all the voting booths. We have to stuff all the bagged, sealed ballots back into the voting machine and lock it up. We have to take this pile of paperwork and put it in this envelope for the city. We have to take that pile of paperwork and put it in that envelope for the county. We have to take down all the signs. We have to sign a whole bunch more things. Finally, about 9pm the closing procedure and checklist is complete. The Chairman takes the stuff and heads for City Hall to give them the vote tally. Forevermore, when I see that line on the election returns that says “85% of precincts reporting” I’ll think of the Chairman on the steps of City Hall, being attacked by the news media and the campaign pollsters as he tries to deliver the vote tally to the City Clerk. All told, we had 1,860 people vote out of a precinct with 2,936 registered voters. That’s a staggering 63% turnout, which I’m pretty sure was higher than our general election turnout for 2000. The other Election Officials, who have been doing this since statehood, had never seen a turnout like that for a primary. We registered about 200 new voters, but most of them (probably 180) were just student address changes. There are not enough people working the polling places. Most of the Election Officials were there from 6am – 9pm. Most of them did not leave the building during that time. I was one of the lucky ones – I was only holed up from noon – 9pm. I brought dinner with me, but had no time to eat it as the busiest time at the polling place is the dinner hour. These people, who are mostly older, survived a fifteen-hour day on some cheese and doughnuts someone brought and on soda pop from the school vending machines. And no bathrooms or water for several hours in the afternoon. So take a half day and help out. 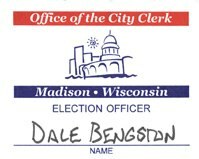 As I discovered, the City of Madison does not make it easy to get on board as an Election Official, which helps explain why they’re short-handed. It turns out to be a lot of fun even when you’re swamped, and the old folks really, really need some new blood to help out. Plus they’re extremely funny and a great deal of fun to spend a day with. If you come to vote during the dinner hour, bring a bag of sandwiches for the Election Officials. The bag will never hit the ground. Remember these are mostly old people so easy on the mayo. If you’re coming to my polling place, bring a bag of sandwiches for the old folks and I’ll take a pizza.